We are independent specialist importers of Rioja and other quality wine from Spain. So if you are looking to buy online, or just find information about Spanish wine, Spanish cava or Spanish brandy, you have arrived at the right place. 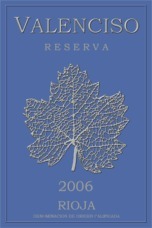 We stock a range of crianza, reserva and gran reserva Spanish wine. You will also find information about Spanish wine regions such as Catalunya (Catalonia), Rioja, Rías Baixas, Rueda, Ribera del Duero, Toro and Utiel-Requena, details of Spanish grape varieties such as tempranillo, garnache, graciano, albariño,verdejo and viura, and a selection of Spanish tapas and food recipes. Other pages popular with visitors to this site are Spanish wine vintage chart, Spanish wine region map and the Glossary of Spanish Wine Terms. 93 POINTS from Robert Parker's Wine Advocate. 6 bottles per wood case.